I haven't commented much lately about what goes on behind the scenes of my training, off-road, off-track, and out of the water --- strength training. That's where it all started for me in my early 20s when I was a competitive powerlifter, and strength training is what drew me back out of blob world over two years ago. The gym gives me community and a sense of place when so much of my training is solitary. I was fortunate to link up with a gifted and passionate trainer, Jake Parks, who I continue to train with today. He brought me into the world of running, which later grew to encompass triathlon too, but I've remained faithful to strength training, hitting the gym 3-4x a week. I work out for just an hour each time, but I train consistently, week-in and week-out. I firmly believe that strength training has given me a certain edge, mentally and physically that I bring with me to the start of every race, and really to all of life's challenges. There are documented, peer-reviewed studies showing the benefits of strength training for endurance athletes like triathletes (e.g. 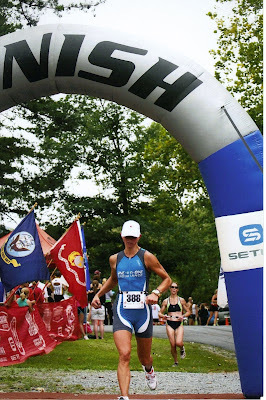 http://www.powertri-blog.com/health-nutrition/why-strength-training-is-essential-for-triathletes.html), but I'd like to speak to my own personal perspective on its vital role in my training. Strength training makes me strong!! Obvious yes, but I love exploring the capabilities and potential of my body. People routinely underestimate what they are capable of doing with a little effort and training, particularly women. I'm thankful to know a bit about what I can do! It's like walking around with a really cool secret....who would guess that this body can deadlift 245 lbs, do 12 pullups or bench 130 lbs? Strength training has shown me that consistent hard work, coupled with patience and faith, does bring results. Some gains have been easy, some hard-won. It's often two steps back and one step forward. But it's important to have faith, don't give up, and keep sub-par workouts in perspective. However, as my ultramarathon friend Shannon reminds me, "you'll never get this workout/race/set/rep back again, so make it count!" I give each workout my total focus and effort. Strength training enables me to embrace pain a little more and fear it a little less. This is the kind of pain one will inevitably encounter in any race. There's nothing like the intense burn of a screaming muscle on a double-drop set of anything, a lap of lunges, lateral raises, calf raises.... But at the gym you learn that the pain is temporary and you can endure it longer than you think. Competition often comes down to the one who is willing to endure more pain, and to suffer more. (suffer more is often my race mantra). Strength training builds mental toughness. Facing different types of challenges gives me a variety of experiences to draw upon when needed. It takes some mental fortitude to squeeze out 10 reps when your brain is reminding you that you've only ever done 8 before. Or to finally bench 135 lbs when you've just barely missed it time and time again. Or to face a big deadlift that you've never done before, stepping up to that big weight just sitting there. But you learn to outsmart yourself, and to ignore your "central governor" that decides what is possible and what is not. It's most often the brain that limits what we think we can do, not the body. Therapeutic strength training has been good for shoring up areas that have been prone to injury. I've had my share of issues and injuries - IT bands, fracture, foot problems, and even a strained collarbone joint. These issues have been indicative of an area of weakness, imbalance, or inflexibility which we have successfully addressed through strength training and stretching. I'm fortunate to be working with knowledgeable and experienced trainer who has some background in physical therapy and rehab. Strength training gives me confidence that carries through to races. When I am pedaling up a big hill and my quads are burning, I'm thinking about all the squats, lunges, leg presses (etc) that I have done and my competitors have not. 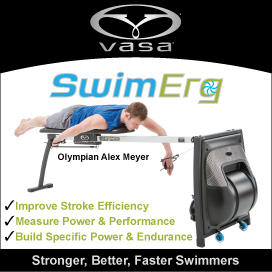 When I am swimming, reaching and catching water, I know I have put in the work to have strong healthy shoulders, lats, and triceps. I am confident that my core is strong and my back won't be an issue on the run. And when my mind is telling me I've done enough, I can reach past it and find a final kick, just like I do with a tough final rep. When I began working with Jake, I thought I knew a lot about strength training from my powerlifting background. My plan was to train with him just a few times and then take over my own training. It turns out I had a lot to learn. Building sport-specific lean muscle mass effectively and efficiently is both art and science, requiring trial and error and careful observation to fine-tune an individualized program. I often think about the fact that I logged at least double the hours in the gym in my early 20s, yet I am stronger now than I was then! It's a testament to the value of training smart. I continue to train with Jake for many reasons. Training with him is efficient and effective and fun. It's hard work, but a bit like grown-up recess playing with stability balls, the bosu, medicine balls, mats, therapy bands, barbells, dumbells and machines. He keeps things fresh and interesting and I'm always learning something new. He works with me on the nutrition side of things, and the built-in accountability of face-to-face sessions keeps me on track and in balance. We set goals and I see results. As a working mom with a busy life, I appreciate being able to show up at the gym and do what is asked of me without having to think about it or plan it. It's one of the few areas of my life that I don't have to manage. He integrates the strength training plan with my triathlon and running plans, which isn't easy given the different types of competitive goals that I have throughout the year. There is a large and growing body of evidence documenting the benefits of resistance training (along with cardio) in the promotion of physical AND mental health. But I think there is an assumption that strength training is a no-brainer and that anyone should be able to find their way around a gym, heave a few weights, work a few machines, and see changes in their body. (Heck, every high school boy could manage the sand-filled weights in the garage, how hard can it be??) When results don't come quickly (or at all) and motivation wanes, that's the end of it. They decide weightlifting is no fun, or conclude that they have a body that is resistant to change. Even more disheartening are the folks with tremendous dedication, who are faithful to the gym, but who lack knowledge to make progress! It's only a small minority of people who will solicit help from a trainer. Yet why is it acceptable to work with (and pay $$) a therapist or psychologist when we have issues, while working with a personal trainer is viewed as an indulgence?? I do get put on the defensive sometimes about working with a trainer. Here's how I feel about that: I rarely hit the coffee shops, I spend nothing on beauty products outside of haircuts, I have no expensive bags/shoes/clothes (exercise clothes and equip excluded! ), I happily drive an old minivan, I don't have a flat screen TV, I've never had a manicure, I don't go to bars, I require no fancy vacations, I don't have a therapist, I spend nothing on anti-depressants, I don't collect stuff, I pack my lunch and snacks, I don't buy jewelry, and I sell things on eBay. I don't need to buy things, go places, or have a certain image to be happy. I feel good physically and mentally, and isn't that ultimately what we are after? We are made to challenge ourselves, we are made to work hard, and we are made to push limits. We spend a lot of time and energy trying to get to and stay in the comfort zone but true joy and satisfaction come from moving beyond comfort. Working with a trainer has certainly done that for me. It's been an investment in health and happiness that carries over to my relationships with my kids, family, friends, and colleagues. Today was a good day. 120 lbs for 5 reps on bench. 104 reps over 8 sets on barbell squats. Tomorrow things will hurt but I will be happy for the constant reminders that I am strong, and I will be glad I moved out of my comfort zone! Saturday marked my debut at the Olympic/International distance at the Luray Triathlon – 1500m swim / 40k bike / 10k run. My four previous races have been sprint distances, typically 750m / 20k / 5k. I’ve done bikes and runs that were longer than Olympic distance for sure, and a few swims that longer as well, but until race day I had no idea how it would feel to string them all together with competitive intensity. My anxiety levels rose through race week for a few reasons. First of all, I’d taken my bike for a tune-up which required two additional bike shop visits just to get the bike back close to working the way it had been, which was pretty decent. It left me with doubts whether my bike would work reliably. Secondly, although I’d had some great open water training swims (thanks Laura, Ellen + Krista, and kayaker Jake!) in the quarry and Claytor Lake, they were pretty solitary affairs without the distracting, energy-draining bumping of bodies. Thirdly, my energy and motivation had been waning for several weeks. I hoped it was a temporary effect of the heat and humidity and just a brief cyclical slump. Race week always leaves me wondering if I’ll be able to put it all together. I’m starting to recognize the cycle and I know that race week is always tough so I just rode it out and tried not to make too much out of it. I knew that I had prepared my best with training, rest, and nutrition. I drove up with my friend Tanya, who was also doing her first Olympic distance event. It was nice that I had raced at the venue in June and had a degree of familiarity. Again, the folks of Luray do a fantastic job readying the courses and site. The heat had relented and we knew we were in for cooler, more favorable race conditions. One of my concerns had been the lake plant life as there was quite a bit to navigate through in June. It was an invasive plant and the town eradicated much of it in time for this race. 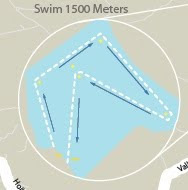 To fit the full 1500 m in the small area of the lake, we had to swim the perimeter then return diagonally up to the middle before heading for the dock, so all the navigating kept it interesting for my brain! This was a solid swim for me. I had the confidence to start in a more aggressive inside position and swim in the midst of the pack. It reduced my need to sight, but there were some collisions and some annoying folks repeatedly taping my feet with their hands. I seem to recall kicking out in frustration at one point! I swam straight and felt like I could sight with minimal disruption to my stroke. The Claytor Lake training swims really paid off with better technique and confidence. Jim said he passed me at one of the final turn buoys and gave me a thumbs-up in the water under my face. I never saw it!! I don’t know if that was due to the low visibility in the water or me being “in the zone”. I finished the swim, headed up the 47 steps with the annoyingly low rise (took them 2 at a time), looked for the last tree on the left as my transition spot landmark, grabbed the bike and went! I love this bike course because the road surfaces are in good shape and well honestly because there’s so much interesting stuff to look at along the way. One could argue that if my level of effort was high enough I shouldn’t notice the sights, but a certain amount of sensory input seems to keep me more engaged or at least distracted from the pain. 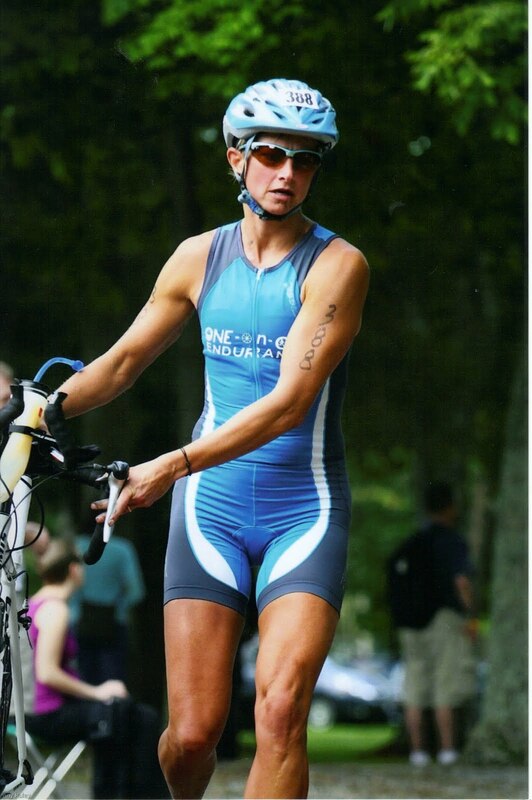 I love the bike phase as I get my chance to make up the time I gave up on the swim, and when you pass people on the bike, you can do so definitively and decisively! All was going really well until just a few miles in when my chain fell off the big ring and looped around my pedal. I couldn’t believe it. I acted pretty quickly, unclipped, grabbed the chain, and fed it back onto the ring. I headed back out to RE-pass those I had just passed. I thought it was just a fluke and didn’t worry too much about it, but then a few more miles down the road the exact same thing happened! It was total déjà vous. Unclip, pull over, replace chain, pass same people again….UGH!! I was not about to lose this race, or worse have my race end, because of a broken chain. I decided I’d better shift very carefully, and as little as possible, and just make it through the bike portion rather than risk a DNF. Along the way I saw other bike casualties – tires, shifters, chains – it’s disheartening to see anyone in that position. I kept on pedaling, with my blackened greasy hands reminding me that I was tough! It turns out I wasn’t the only one with a chain issue. Coach Jim’s chain completely broke a mile or so from the finish, taking a chunk of rear derailleur with it. He had the presence of mind to run the bike up the last big hill and coast as much of the final stretch as he could. The broken chain cost him a number of valuable minutes, but he still pushed on hard through the run. He’s a fierce competitor with high standards for himself and his athletes. I had a slightly slow T2 as I took a few moments to wipe some grease from my blackened fingers. I grabbed a gel, stuck it in my pocket, and promptly forgot about it!! The run is a two-loop course. As you complete the first loop you come within 25 yards of the finish line, but have to turn around and do it all again! How cruel!! The out portion of the loop is a bit up, the return it a bit down. It took a while for my watch to catch the satellites and start working, but the mile splits I got show how erratic I ran, in part due to the terrain, in part….well….I guess I was just erratic. They are: 7:23, 8:08, 8:09, 7:06, 8:10, and 7:52. The plan was to start conservatively, around 7:20-7:30 and then get progressively faster. Doh! Frankly the course was sufficiently painful that I went to Plan B – ignore the watch, go by perceived effort, try to pass folks one at a time, and work like hell to avoid getting passed. Oh, and try not to look like you are dying to psych others out. One of the challenges of the two-loop course is that you don’t know for sure if someone is on loop one or two. So you have to assume they are on the same loop as you and that you’d better pass…particularly if it is a woman with a number 40 or greater on their calf!! Also, the master's women were split between two swim heats so it was not head-to-head competition with the whole group. I’m always impressed by the people on the course who are able mutter (or shout) encouragement to others. I’m convinced the shouters, yelling to those running the other direction across the road, could probably be working harder if they are capable of yelling. But the mutterers…they are giving that last ounce of energy to offer support! I’m somehow not capable of uttering anything, but when I see someone struggling I am thinking all kinds of profound things to say, but I can't quite form the words. But the positive mental vibes are flying in their direction!! Coming into the final bit, I heard Coach Jim yell that someone was on my heels. I gunned it and held a 6-second lead over the next female finisher, a 41 year old who had the second fastest run time!! Every second counts. 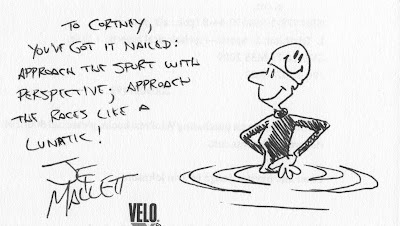 Jef Mallett, author of one of my favorite funny triathlon books (Trizophrenia: Inside the Minds of a Triathlete), was at the race. He completed the Luray double – the International on Saturday and the sprint on Sunday. He is a formidable racer and great guy to boot. He autographed my book and it was so appropriate! I told him his writing helped me keep perspective during race weeks, and how funny that he chose swimming to represent me! This race, like all races, left me feeling humble, grateful, and happily depleted. I love to be around so many different kinds of athletes. We’re fast, slow, tall, short, big, small, old, young, but we have a common thread that gets us out there to face a slew of unknowns. 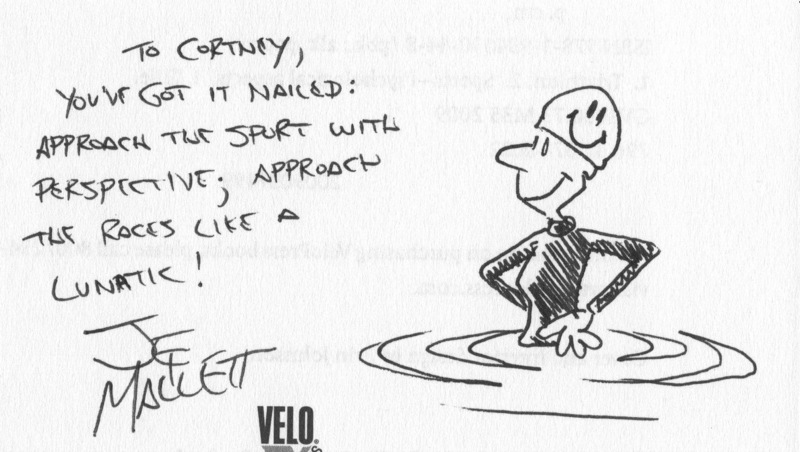 I think this makes it easy to have a culture of respect among triathletes. I am beginning to recognize my own predictable patterns of race week and the pre-race hours. It doesn’t make it easier but I can ride it out and not make too much of it. Again Jake put together a race week meal plan that left me feeling light but energized and I had no GI issues whatsoever. Eating well is key. I felt really good about the swim tactics and efficiency this time around and I have faith speed increases will come. I was happy that I dealt with the unforeseen bike issues without too much panic. I know I can do a better job on the run strategy and squeeze a little more speed out of myself. Coach Jim has been working with me on pacing but it does no good when I throw it out the window on race day and resort to my unreliable “gut instincts”!! One more race remains for this season….Smith Mountain Lake on September 25. I’d like to have a strong and smart run. Five more weeks to train and gain!! Thanks to everyone who makes it possible for me to train and race - Coach Jim, trainer Jake, my family Robert, Spencer, and Grant, my folks, friends and fellow triathletes!! I never forget that it is a privilege to be able to participate in this sport and benefit from the wisdom and experience of a great coach and trainer.